I was asked a long time ago now whether I would be willing to give HandyLinux a go. Due to time constraints this review has come about much later than I hoped it would. 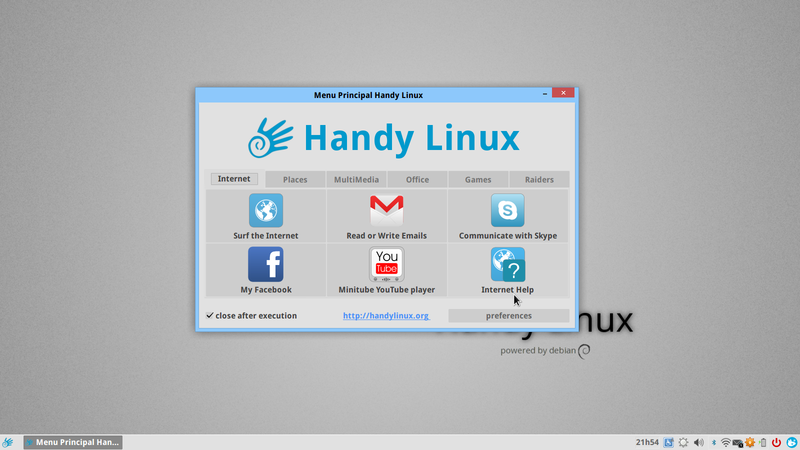 HandyLinux is a French Linux distribution based on the Debian Stable branch (Wheezy). HandyLinux is accessibility for all and freedom for everyone to evolve on its own. 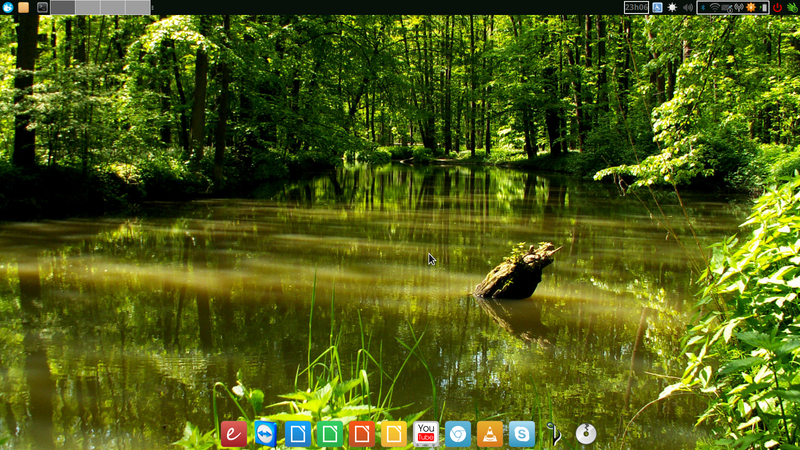 Based on Debian GNU/Linux with XFCE, a fast, light and stable desktop environment, HandyLinux is safe, handy and free. Designed to facilitate access to computers those who start, children, seniors and those who are looking for simplicity. The above quote was taken from the HandyLinux website. 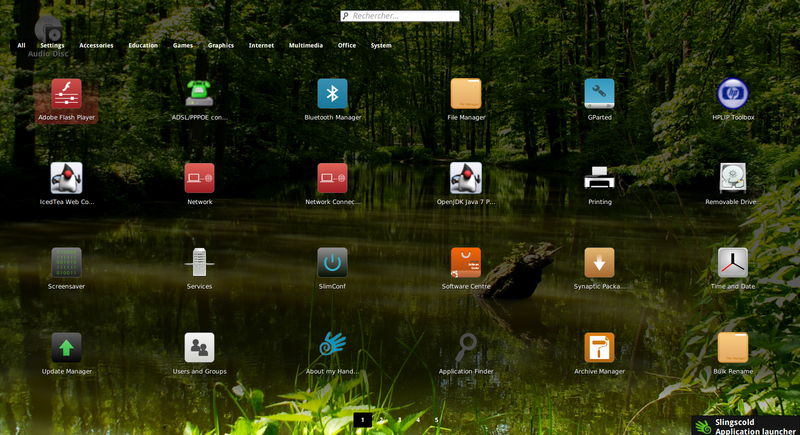 The aim of HandyLinux would appear to be to provide a simple, light and easy to use Linux distribution for everyone. This distribution is only there to facilitate the use of your computer. Once your environment tamed, you simply remove the facilitating options and you get a “classic” Debian distribution with XFCE as desktop environment. In essence what this appears to be saying is that you install HandyLinux to get used to Linux and then when you are happy with Linux you can continue to use the base Debian distribution. The default desktop environment is XFCE and so HandyLinux should work well on most computers. There are two versions available. The 486 version is for computers made prior to 2005 and the 686 version is for anything more up to date than that. Instructions for creating a DVD and USB drive are available from the above link. Essentially all you have to do to create a DVD is burn the HandyLinux ISO to the DVD using your favourite disc burning software. For burning HandyLinux to a USB drive you can either use LinuxLive USB Creator (Using Windows) or if you are already using Linux run the following command in a terminal. I would recommend following the instructions from the download page.. Note that if you would prefer to, you can buy a HandyLinux installation DVD here. There appears to be a non-PAE version available as well. When you boot HandyLinux from the DVD or USB, a menu appears asking whether you want to try it in a live environment or install it to your hard drive. Normally when you enter the live environment for a Linux distribution you can play around and then run the installer without rebooting but for HandyLinux there doesn’t appear to be an install option available. If you are going to try HandyLinux give it a spin in the live environment and then reboot and choose the install option. I usually provide step by step instructions showing how to install the Linux distribution that I am reviewing but the HandyLinux developer(s) have done a fine job in detailing the steps required. The above screen shows the essence of what Handy Linux is about. When you first boot into HandyLinux you are presented with a plain desktop and a single XFCE panel at the bottom. 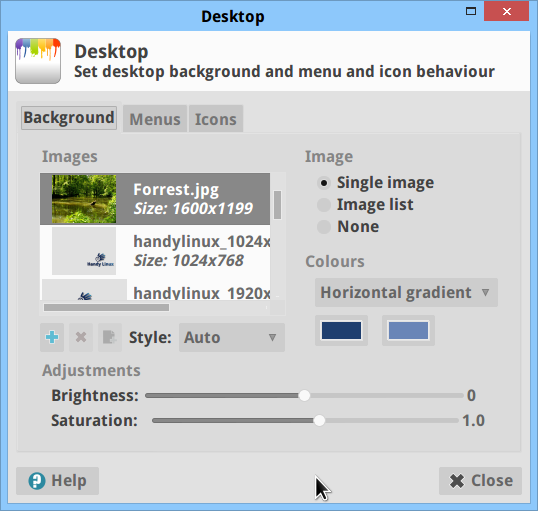 The icon in the bottom left provides access to the Handy Linux menu which is displayed in the middle of the screen as shown above. On the right side of the panel there are system icons for adjusting settings such as the volume control, connecting to wireless networks and power settings. There is also the customary clock. The HandyLinux menu is an interesting feature. There is basically a tabbed display with tabs for internet applications, places, multimedia applications, office applications, games and raiders. Most of the tabs are self explanatory. For instance on the internet tab you can access the internet or read your emails and on the office tab you can use the word processor, spreadsheet application and presentation tool. The one that might seem confusing is “Raiders”. The “Raiders” tab gives you access to a terminal window, the package manager and system settings such as printers and networks. Incidentally, whilst running the live version of HandyLinux everything worked fine but after installing the full version to disk the HandyLinux menu wouldn’t start when I clicked on it. The file was found in /etc/skel/.config/user-dirs.dirs. I therefore copied that file to /home/user/.config/user-dirs.dirs using the following command. After copying the file, the menu started to work correctly. Connecting to the internet is as simple as clicking on the network icon in the system tray and choosing the appropriate wired or wireless network. You will probably have to enter the security key if you choose a wireless network. Debian is a community distribution and it also provides only free software. This means that if you want to watch proprietary videos using Flash or listen to music in the MP3 format you have to jump through a few hoops. HandyLinux has removed those hoops and it is possible to watch Youtube, play Flash games and listen to MP3s without adding repositories and installing further software. 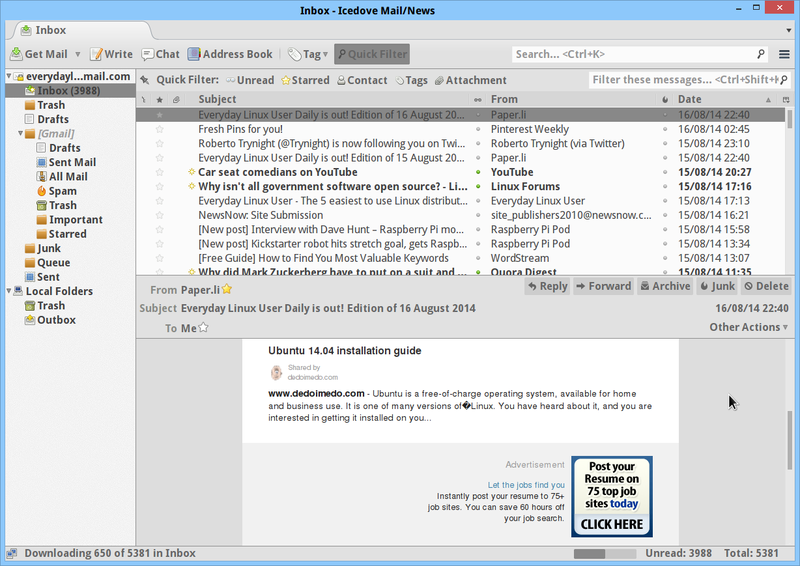 The IceDove email client is fairly decent. It is easy to connect your current email especially if you use one of the major webmail providers such as GMail. Skype is obviously good for staying connected to friends, family and business clients. Teamviewer makes it possible to share your desktop or connect to somebody sharing their desktop. This is good if you are supporting your parents’ computers. 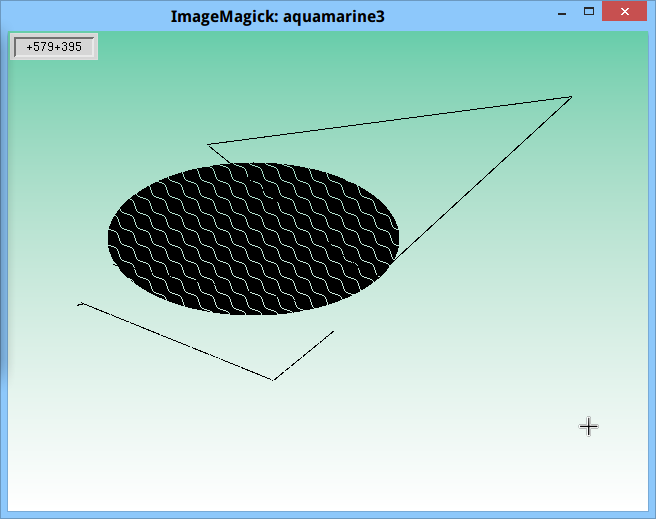 ImageMagick isn’t the best drawing or image editing package that you will ever use. Alternatives to install would be GIMP or Inkscape. 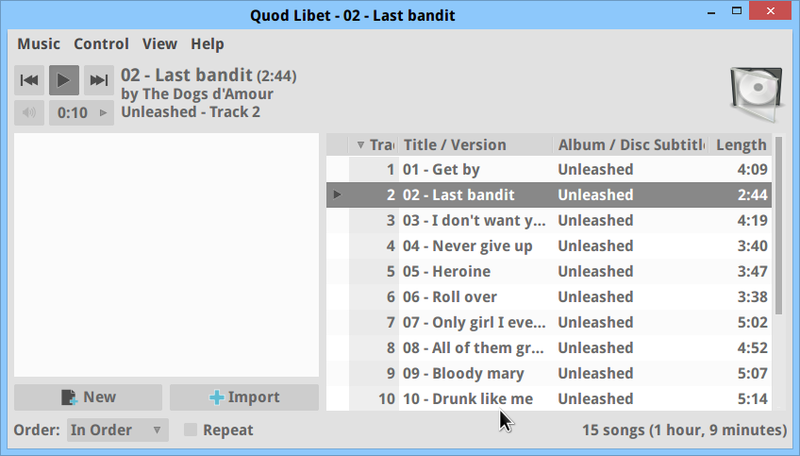 The image above is the Quod Libet audio player. It is functional but an interesting choice because there are loads of great audio players for Linux, even if you are trying to go for something light on resources. Personally for lightweight audio players I would consider GMusicBrowser or Noise. 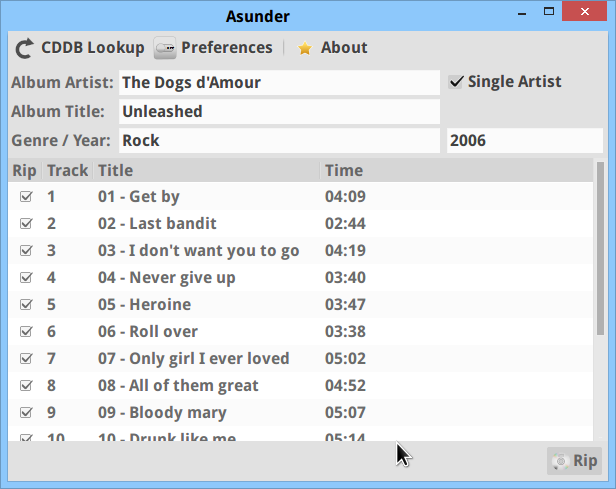 Asunder is a decent CD ripping application and it is able to convert audio files to the free OGG format or MP3. Minitube is a desktop version of Youtube. 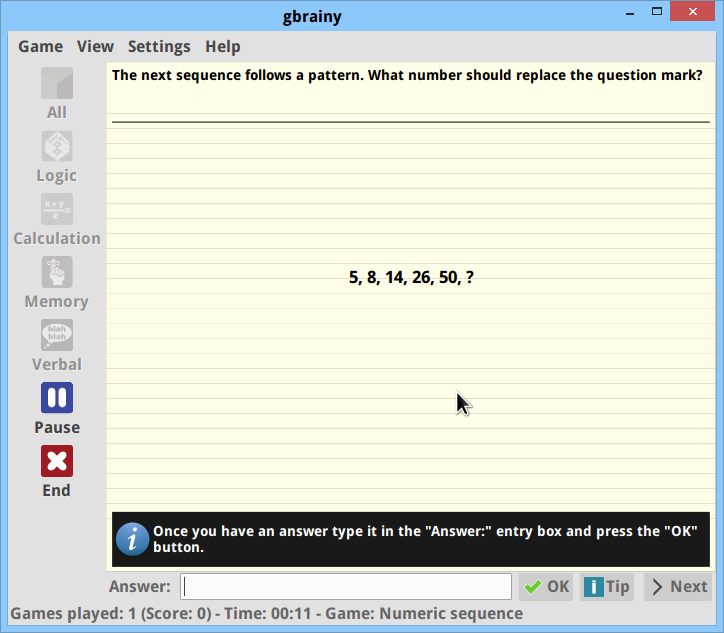 The interface is basic yet functional. The RadioTray application adds a widget to the XFCE panel. When highlighted a menu appears with a large number of online radio stations sorted by category. HandyLinux has a software centre similar to the one that comes with Ubuntu. Note that the repositories are for Debian Wheezy and so the applications are limited. You will not find Steam or PlayOnLinux. If you don’t like the Software Centre you can also use Synaptic which is more basic in looks but more ultimately more powerful. The HandyLinux desktop doesn’t look particularly inspiring. 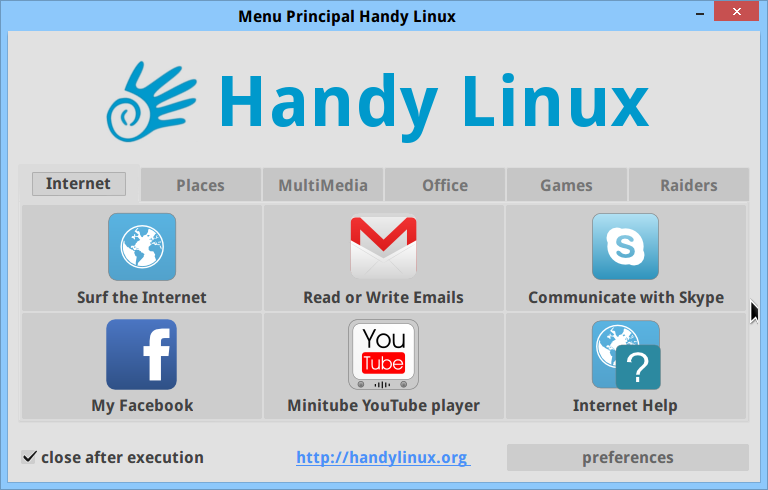 The HandyLinux menu (HandyMenu) is fine for a little while but it is fairly limited. 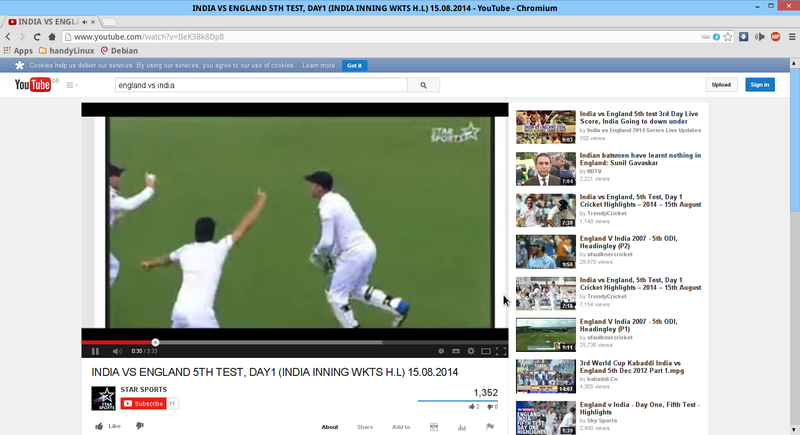 It is worth noting that the XFCE desktop environment is incredibly easy to customise. It is also worth noting that HandyLinux also has the Whisker menu available and the Slingscold dashboard style menu available. As you can see from the image above, the Whisker menu is more traditional in style with a list of categories and applications. There is also a search box available. The Slingscold menu provides an iconised view of applications split by categories laid out at the top of the screen. You may have noticed in the images above that I had changed the desktop wallpaper. Changing the wallpaper is as simple as right clicking on the desktop and choosing “Desktop Settings”. HandyLinux has some plain wallpapers with the HandyLinux logo and some really nice photos. You can also add your own images by clicking on the plus symbol and locating the file. 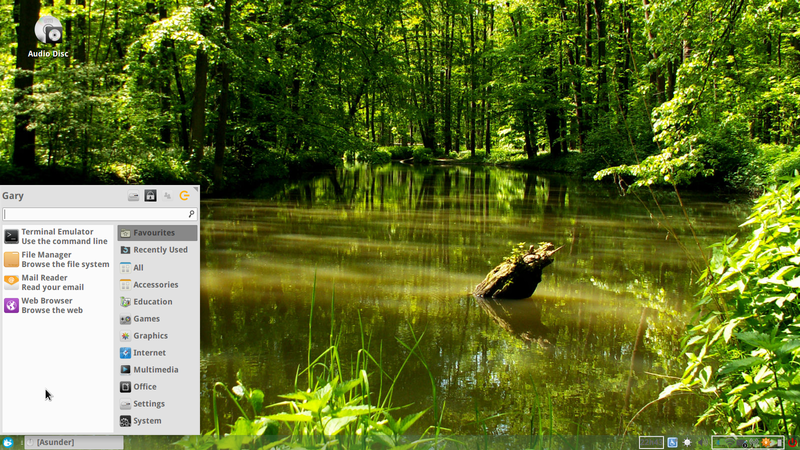 With just a small amount of tweaking the desktop can be made to look more attractive and much more functional. The HandyMenu didn’t work after installation. I had to copy files around. Despite installing the English language version a lot of the menus had French terms. Examples for this include the Slingscold menu (search shows as recerche), Chromium loads in French, RadioTray has French radio stations. 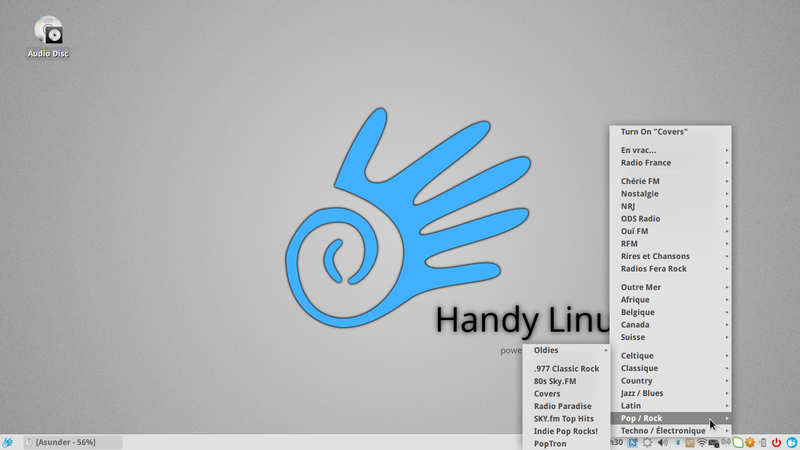 HandyLinux was created using the Debian Live Build tools. This distribution shows you a small sample of what can be achieved with Debian. HandyLinux was reasonably easy to install and there is a decent if not spectacular set of applications installed by default. The HandyMenu will probably be useful for people who want a basic computing experience but for everyone else there is the inclusion of Whisker and Slingscold. Using Debian Wheezy as a base makes the system a little bit limited in terms of available software. I would recommend using the testing branch as a base. There were a couple of issues as highlighted but nothing too hard to fix. It would probably be a bit disconcerting for a really new user to hit the menu icon and for nothing to happen. The only guarantee that you will see all of the articles on this siteAll of this leads on to another article that is coming up regarding when and why you would use Debian. If you want to read that or any other forthcoming articles why not subscribe via email (box in sidebar) or follow me on Twitter (@dailylinuxuser). Gary, would it be possible to include if a distro is UEFI capable? I would guess the pre-2005 is not, but wonder if the post 2005 is UEFI capable. Otherwise a great review as always. I will give Handy Linux a try on a USB key. That is a good suggestion. I will try and add that it to all future reviews. As this is based on Debian it should be but I will try and boot from the USB tonight to make sure. Thank you for the review. In your instructions for creating a bootable USB stick, you might want to mention that "/dev/sdb" might not be the correct device — people should take care to figure out which device is the USB stick they want to write to. Otherwise, there's a chance they could wipe out another disk! Good point. I will change that now. This one is a nice review. I read it yesterday and then downloaded Handy this morning. I then ran it from a USB drive on my Intel Atom netbook. Yes, it's fast and lightweight. 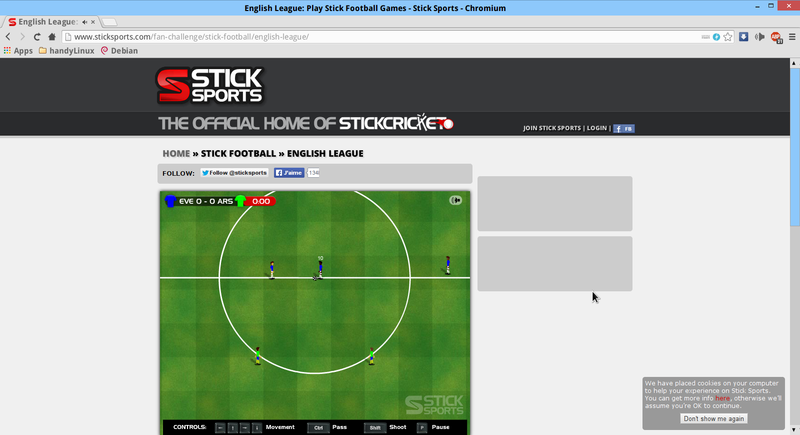 we commit the 1.7 version with Iceweasel instead of Chromium and some improvments for all. come to visit us and leave a message on the forum, we'll appreciate your review, very complete. see you soon I hope.